Dr. Neale Martin has been working with high technology companies since 1994, helping them adjust their strategic thinking in light of rapidly evolving market realities. For the past several years, he has worked on updating the principles of marketing in light of research from cognitive psychology and neuroscience that reveals most of human behavior is the result of unconscious habits. The result of this endeavor is Habit: the 95% of Behavior Marketers Ignore. Marketers have listened to customers for decades. Unfortunately, they have been listening to the wrong part of their customers' brain-the executive mind. 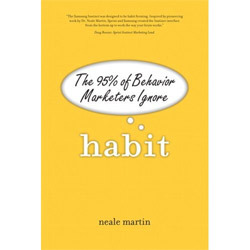 Habit opens up the world of the habitual mind, the place where customers make most of their purchase and use decisions. From designing products to creating long-term loyalty, habit explains how winning the unconscious mind is the key to success in the marketplace. Many of marketing's most frustrating failures (satisfied customers defecting, new product failures, billions of wasted advertising dollars) are the result of the habitual mind's control of behavior.